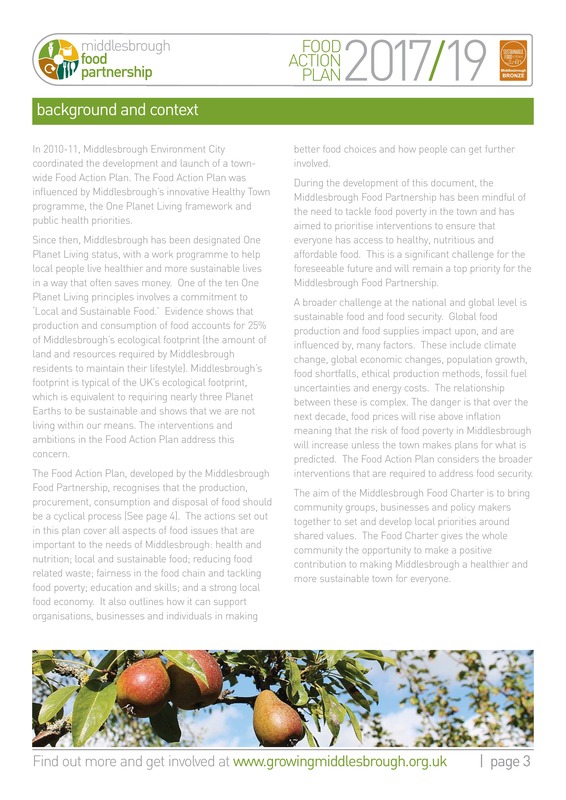 Middlesbrough Food Partnership aims to make the town a place where local people can eat good quality, healthy food that is easy to buy, offers value for money and is produced locally wherever possible. The choices that we all make about food have far reaching consequences for our health, well-being, the environment and the prosperity of the town. Food is a valuable resource and people should have the opportunity to eat healthy and sustainable food that is easier to buy and offers value for money. The Food Partnership will support local businesses and settings to procure an provide healthy and sustainable food to boost local prosperity, encourage healthy eating and protect the environment. The Food Partnership will inspire and enable the local food culture so that all residents have access to buy, grow, produce and cook affordable, affordable, healthy and sustainable food. The Food Partnership will help residents and businesses to minimise, recycle and compost food related waste either individually or collectively to increase sustainability of local food. 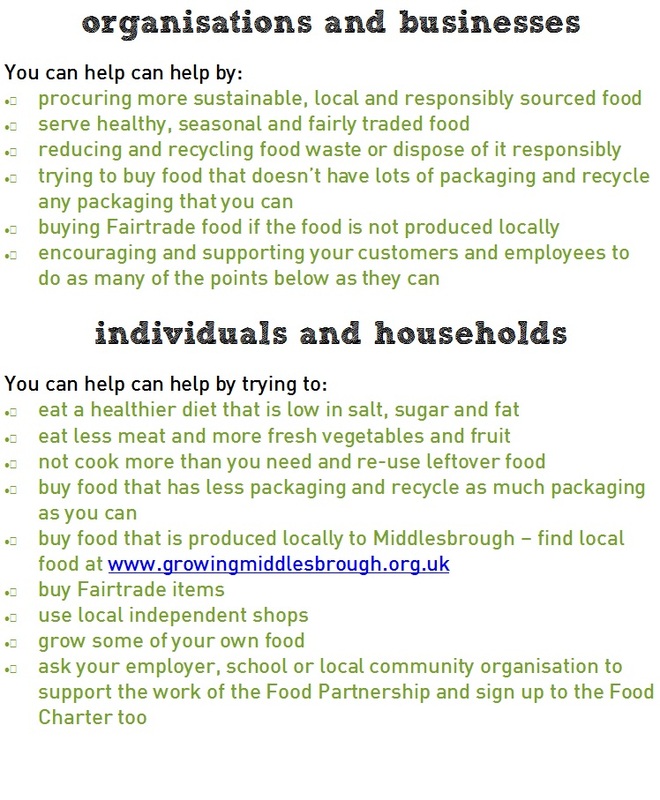 In 2010-11, Middlesbrough Environment City coordinated the development and launch of a town-wide Food Action Plan. 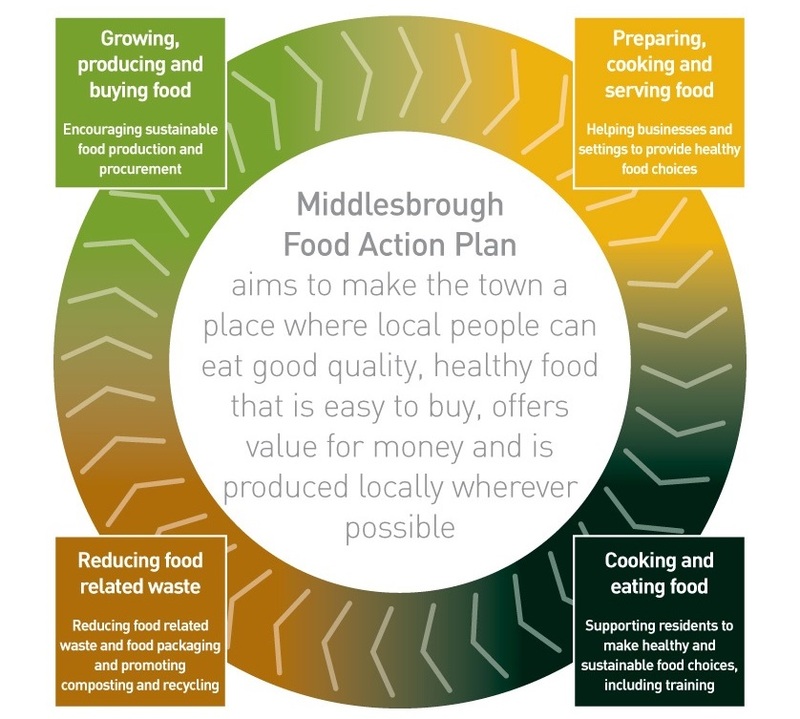 The Food Action Plan was influenced by Middlesbrough’s innovative Healthy Town programme, the One Planet Living framework and public health priorities. In 2011, a UK Sustainable Food Cities network was established, which is developing and sharing best practice with local communities. Middlesbrough is now an active member of this network. 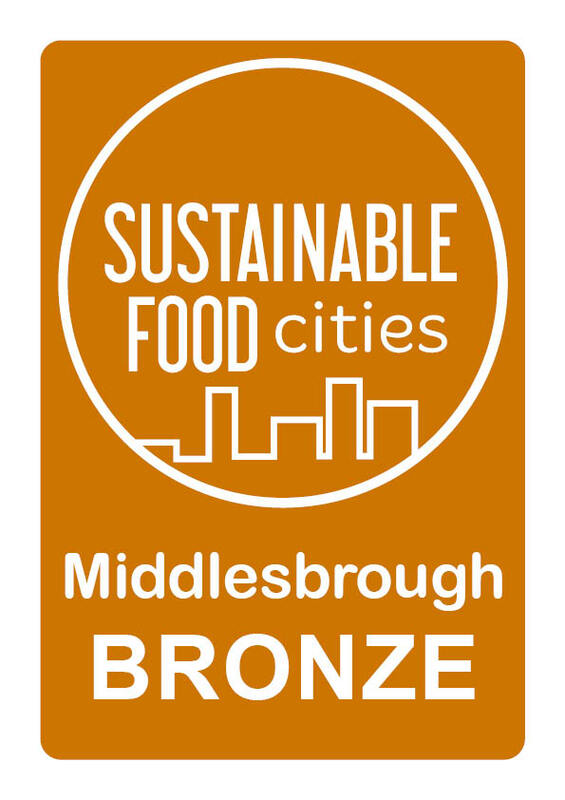 In 2017, the achievements of the Middlesbrough Food Partnership were acknowledged and Middlesbrough received a Sustainable Food Cities’ ‘Bronze Award’. The Bronze Award and the Food Action Plan would not have been possible without the valuable and ongoing contributions of the people and organisations that have supported the Middlesbrough Food Partnership. Thank you for your interest and support. The Food Charter helps guide households and organisations to take positive actions towards the shared goals of the Food Action Plan. Please consider what you can do to help and show your support by signing the Food Charter and committing to the aims of the Plan.